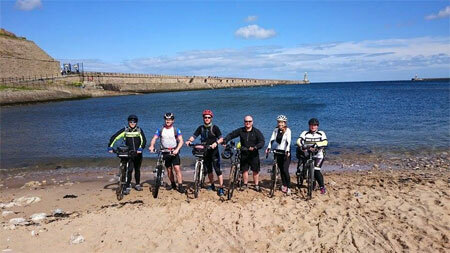 Cycle the coast to coast route from Whitehaven to Tynemouth. Over 3 days, 2 nights. Tynemouth night before at Premier Inn Edmund Road, Holystone, Tyne And Wear NE27 0UN. Cycle the Coast to Coast route from Whitehaven to Tynemouth. Origin Inspired & Social Circle bring a cycling adventure of a lifetime. Take in the incredible views of some of the most scenic places in the world as you cycle from Whitehaven to Tynemouth. Tyne And Wear NE27 0UN. You can park your cars at Premier Inn and we are transported in the morning at 6.30am to the start of the C2C route at Whitehaven harbour and the iconic C2C sign. Bike from Whitehaven to Penrith – distance about 55 miles. This is a great day to get you started with some beautiful biking bringing you into the Lake District National Park. A good challenge awaits to get over the Whinlatter pass and you have the choice of the Old Coach Road (rough and ready mountain bike route) or the more friendly cycle path via Greystoke to lead you to Penrith. Overnight in a great B&B in Penrith. Day 2 – Bike from Penrith to Stanhope – distance about 46 miles. For many people this is the toughest day with a stiff climb over the infamous Hartside pass, reaching over 1900 feet above sea level. There is a big downhill on the other side but some challenging, steep hills to tackle through the old mining towns of Nenthead and Allenheads with lovely and interesting scenery along the way. Overnight in a B&B in Rookhope or Stanhope. Day 3 – Bike from Stanhope to Tynemouth – distance about 40 miles. Once the initial climbs are dealt with today it’s good, fast going and is almost all flat or downhill to the North Sea coast, the official end of your epic journey. We then return to our cars and head home. 2 nights (Friday in Keswick & Saturday in Stanhope) comfortable B&B accommodation. Breakfast included but not evening meals (there are places close by to eat in the evenings). Vehicle backup in case of mechanical or physical breakdowns! We will use a company to provide a comprehensive backup service that means they are there to help you out with any problems with the bikes or tired bodies (which we won’t have I’m sure)! We would always encourage people to bring their own bikes in terms of comfort but they can also arrange good quality hybrid bike hire for anyone who needs it and including helmets, locks, tools etc it would cost around £65 per bike for the trip (not included in your charity target). We will have a fully trained first aider with us and a trained bike mechanic too. The B&B prices are based on twin room prices, evening meals can be got from local pubs, restaurants, or bring your own. You will need to provide your own food for lunches and during the ride (B&B's provide lunch for £5). Everyone has their own requirements so it is easier for you to have your own snacks etc. Although it is not a really hard route you will need to train before this trip. We want you to enjoy yourself and this requires a good level of fitness. We will be organising a couple of practice rides before the trip plus we have a nutrition advisor and Personal Trainer available if you need help with training tips and advice on foods for training and during the trip. Your target to raise is £375, The Charity is Sound Sense www.soundsense.info Your deposit is £75. Your place will not be confirmed until your deposit is raised. All monies must be raised before the event. Watch the Coast 2 Coast Video here. Walking weekend or an overnight stay in another city, Social Circle weekends away are just the ticket!